Rebecca Simpson (left) and Annie Dunham were runners-up in the women's pairs national final. 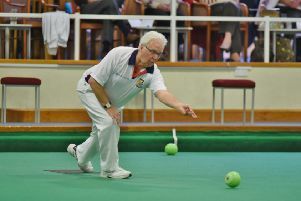 Spalding’s Rebecca Simpson and Annie Dunham just missed out on a title at the English Indoor Bowls Championships at Melton Mowbray on Saturday (April 4). They were beaten 15-3 by Sue Kearsley and Janice Gower from Blackpool in the women’s pairs final despite leading by seven shots at one stage. She will be back to challenge for the triples title later this week. Simpson and Dunham were maids of honour at each other’s weddings. “I wish we could have banked some of the shots we scored in earlier rounds,” said Dunham. After trailing 11-4, Kearsley and Gower scored 11 shots to their opponents’ two, taking the lead for the first time on the penultimate end, and clinching victory with a single on the 21st. In a nail-biting semi-final, the Spalding pair scored a double on the last end to break a 16-16 deadlock against Egham’s all-England pairing Kylie Hampton and Helen Tuohy, after Tuohy had seemed to tip the scales Egham’s way mid-game when she turned four-down into three-up. They sailed through two rounds and into the semi-finals, beating the favourites Sandy Hazell and Wendy King from Kent, 24-5, and a pair from Rugby, 28-6.